The golden leaves of aspens aren’t the first to fall when autumn arrives in the Western mountains. The rates at Rocky Mountain dude ranches take a dip as early as mid-August. When kids return to school, and demand from families’ decreases, member ranches of the Dude Ranchers’ Association (DRA) typically offer lower rates, shorter stays, and special weeks. It’s a time for couples, singles, girlfriends, and parents looking for a break, a time to kick back with no meetings, no schedules, and no worries. Since 1926, the DRA has worked to maintain the authenticity and uphold the highest of standards in the industry for the Western ranch vacation. With more than 100 members in the American West and Canada, DRA ranches are found from Arkansas to Alberta. Add the drama of fall color to discounted rates and special weeks and a DRA ranch is the ideal ticket for a fall holiday. This is especially true for guests of Southwest Colorado’s Wilderness Trails Ranch where the schedule of activities is same as summer’s yet reservations are limited to 25 adults each week through September 26. Rocky Mountain colors are at their peak September 27-October 3 during “Ride the Colors of Fall Week”, when riders of all abilities enjoy stunning days in the saddle. Evenings bring elegant wine-paired meals, live music, sunset hayrides, or just gathering around the lodge fireplace. Travelers may want to linger a little longer in the area for Durango’s annual “Cowboy Gathering,” October 1st-4th where they can take in performances by celebrated cowboy poets and musicians, rodeos and the cowboy convention. “Cowgirl Up” is an all-inclusive woman’s adventure presented in the simple yet elegant style of NW Montana’s Bar W Ranch. A horsemanship clinic for riders of all levels kicks off the getaways September 27th – October 3rd and October 11th – 17th. Once each cowgirl pairs up with a horse, it’s off to explore hundreds of miles of trails in the spectacular Spencer Lake wilderness. Women can choose to learn new horse-related skills taught by expert wranglers. Girls let their hair down at night with cocktail receptions or a little “two-stepping” at the Blue Moon. Or, they may submit to the ultimate in pampering with spa treatments followed by stargazing from the hot tub. 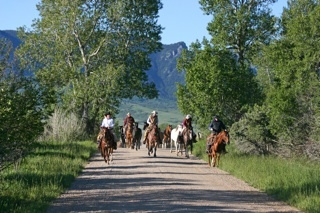 Idaho’s Red Horse Mountain Ranch brings together unattached men and women September 27- October 3. During Single’s Week, folks can meet others who enjoy outdoor adventure in tranquil surroundings. Although the ranch is just an ninety minutes from the Spokane Washington airport, the remote setting near the eastern shores of Coeur d’Alene Lake is a recreational nirvana for riding, swimming, kayaking, hiking, and fly-fishing. Who Knows? Friendship for sure, maybe even romance may unfold under the star-filled nights of Northern Idaho. Culinary arts are the focus at Alberta’s Homeplace Ranch September 27-October 5, dates for the annual and ever-popular “Taste of Alberta.” All the meals this week feature the ranches own recipes using only Alberta grown and created ingredients, including the Big Rock Beer, Alberta’s finest adult beverage. The foothills of the Rockies locale provide a feast for the spirit while the menu serves up a feast for the body. Assistance with planning your ideal fall dude ranch adventure is just a click away by going to the Dude Ranch Association website www.duderanch.org, or by phoning the organization to request a free catalog at 866-399-2339.